No fancy unisex salon here, just an outdoor setting with an old barber’s chair, a large audience and a lot of laughs. Not sure the haircut would win the stylist’s award of the year, but it didn’t cost me an arm and a leg either. At the Golden Tulip Hotel, Amritsar I revelled in the luxury of room service, hot baths, the morning paper delivered, restaurant meals, the bed turned down at night and best of all, dry cleaned & freshly pressed riding gear. I know, I know, that’s not really roughing it and certainly not what you’d imagine motorcycle travel to be, but the odd treat here and there certainly helps ease the aches and pains. Besides Lynne’s not up for a stay in a dhaba – strange that! I made the most our the time at the border town to get the burn holes in my pants mended, and the pannier bags reinforced. I tried without success to buy a new brass horn for Effie given the present one had been squeezed one too many times by enthusiastic onlookers. Everything on the bike is safe apart from the horn – no one can resist squeezing it just once. Multiply this by 100 and you can gauge how much use it gets each day. But just because there were brass milk cans all over Amritsar didn’t mean brass bike horns were easy to come by, so I ended up sticking with what I have until a replacement turns up. All too quickly and it was time to ride for the border, but this was something I’d been eagerly anticipating for a while. Lynne had flown from Udaipur to join me & once again we were reminded of how much we enjoy being together. The idea of having her join me in Pakistan and Iran was initially met with scepticism as she wasn’t inclined towards having to wear a hijab. After reading a few accounts of women who enjoyed traveling through these places despite the dress code, she began to warm to the idea. We found a shop that specialized in shalwar kameez, the baggy pants and long shirt, finished off with a dupatta (matching scarf). With hundreds of colours and fabric to choose from, she settled on something that wasn’t too eye catching, nervous about being conspicuous. A local tailor promised to deliver sew the outfits and have them delivered to our hotel by 9pm that night. Sure enough they arrived on time and fitted perfectly. We visited the Golden Temple early in the morning hoping to beat the crowds. The building itself is certainly impressive given it’s the holiest Sikh shrine in the country. Devotees lay prostrate on the ground, performed rituals and even bathed in the lake, seemingly oblivious to the early morning chill. Apart from the temple and the Wagah border changing of the guard ceremony there’s not much else to bring visitors to this western corner of India. But as with everywhere in country people were friendly & welcoming, including the hotel manager, an avid biker who didn’t seem to mind that we weren’t the usual 4 star clientele. It was unsettling to witness our first motorcycle accident – the unconscious man being brusquely lifted into the back of a rickshaw and taken to what I can only imagine was the most basic of hospitals. People assisting were oblivious to the danger of moving a victim with head trauma and the great loss of blood signified this was serious. A grim reminder about the danger of not wearing a helmet (very few people here do) and another opportunity for us to be grateful for the healthcare services we enjoy back home. March 8th – Lynne had a plane to catch back to Oz to apply for visas and fulfill a house sit obligation. I had a border to cross, and only 30 kms away, another country to explore. It promised to be a long day if past experience was anything to go by, so an early start made the most sense. I was psyched up and ready for the money-changers, border guards, customs officials, touts and of course the paperwork, but everything else would be a totally new experience. That’s the exciting part of motorcycle travel, it can be bone wearying, unnerving, full of highs & lows, yet even on a bike this old, it’s addictive….so like they say, bring it on. Hi Ron, caught up with Lynne last Sunday and she is enjoying her tripping and catching up with you along the track. Keep enjoying this experience and realy the hair cut looks OK. Missing Lynne, but heard she’s got her Pakistan visa and the Iranian one is in the pipeline so all’s good. We should get to meet up again in a few weeks time. Glad you like the haircut. 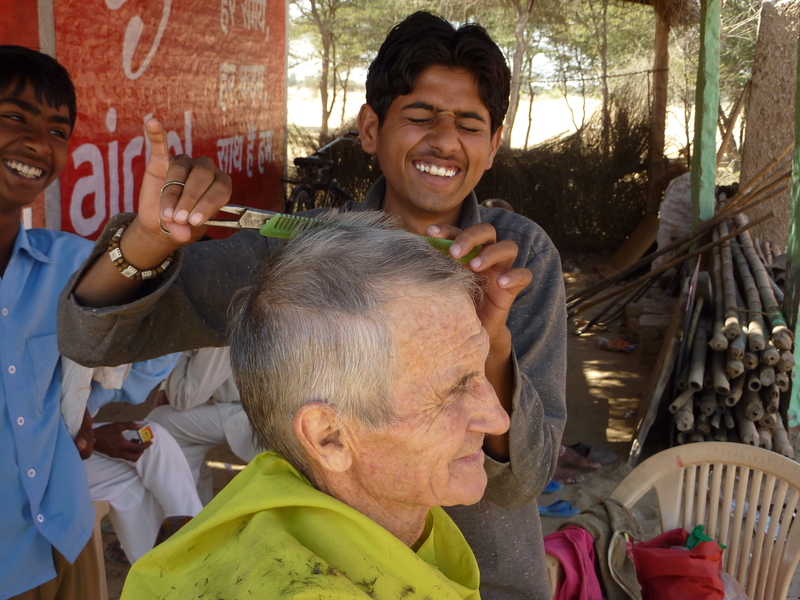 I’ve seen some interesting outdoor salons along the way – funny how things seem normal after a while. I keep reading your stories. Perfect, keep them rolling. When do you expect to arrive in Liege/Hertal in Belgium ? ?